Step 1 – Throw away your not-so-smart phone. It’s a worthless item when you really depend on it. Step 2 – Get on Highway 169 in Ely – that is Sheridan Street – head EAST (not north, not south not west – east) on Hwy 169. Ely’s Sheridan Street is East and West oriented. You WILL pass the International Wolf Center on your right at the edge of Ely. If you pass Babe’s Bait on your right side, you are going the wrong way. If you see a large Good Year sign on a garage on your right, you are heading the wrong way. If you see reference to the Echo trail, you are heading the wrong way. Step 3 – Continue heading EAST on 169. Step 4 – In three miles from the Wolf Center, you will come to Winton, MN. Step 5 – Continue driving at -55 mph- STRAIGHT AHEAD going RIGHT PAST WINTON. Do not slow down to make the turn into Winton. You don’t want to go into Winton. You want to drive right past Winton. Ignore your GPS no matter HOW lost you are feeling. Continue straight ahead on 169. You can do this! Step 6 – We are 12.1 miles ahead from Brandau Plumbing. The road you are on WAS Hwy 169 but then morphs into County Rd 18 or better known as the Fernberg Road. Step 6.5- Drive until you feel lost in the woods. You are doing it correctly. You’ll cross the Garden Lake Bridge – big concrete thing- water underneath. Step 7 – You will pass signs for Fall Lake, then in about 7 miles, you’ll see Wood Lake, then in about 2 miles Tofte Lake, then you’ll see the Ojibway Lake sign which is in front of our sign that is blue with a red, reflective arrow pointing north or to your left. All of this is on your left or driver’s side or north side of the road. We usually have a big banner on the road which makes references Northwind Lodge, the Fernberg Gallery, fishing tackle, cabins for rent, etc. Step 8 – Slow down, and turn there and drive down to the large building with gray, double doors. Stop the car to the left where you will usually see a red truck parked. Angle park right there. If you park parallel to the red truck, you will be angle parking by default. If you park perpendicular (look it up in google) to the truck , you’ll mess up about three parking spaces needlessly. Step 9 – Congratulations on a successful navigation strictly with written notes and no Siri or Cortana to guide you in. Refreshing isn’t it? In all seriousness – we are unable to get Nav Tec or whomever is responsible for land mapping to correct our location on GPS devices despite countless attempts and even wasting $20 bucks on a two-hour class. Hence, the need for old-school techniques in navigating. Get a map, buttercup. Learn how to find your current location and our location and then connect the dots. Follow the line that symbolizes the “road”. Do not just head your car through the woods on the shortest route. You won’t make it. You’ll hit trees, rocks, and water. I don’t care how great you think your car is because it has WIFI , Bluetooth, all-wheel-drive, and 27 cup holders; it still won’t make it through the woods. Stay on the road and watch for animals that pop out at you. 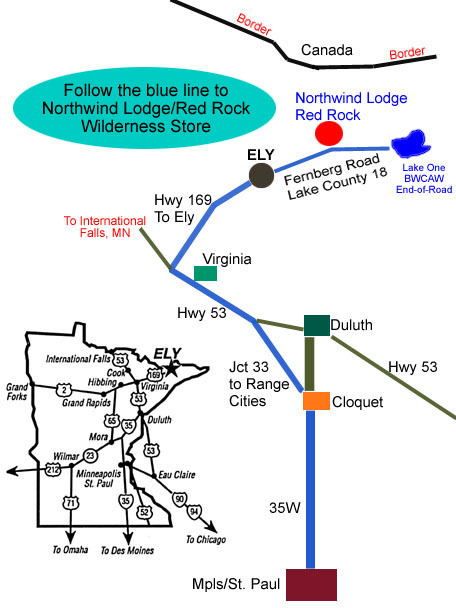 Northwind Lodge is located on Jasper Lake, 15 miles NE of Ely on the Fernberg Road. If you are using your cell phone, GPS, Tom-Tom (do they still make those?) or other mapping device, you will ultimately end up in Winton, MN at Brandau Plumbing. Brandau Plumbing is not the same as Northwind Lodge. You can tell by the spelling for starters. Also, the toilets and showers on display inside should be a dead giveaway. But don’t let that stop you from stopping in at Brandau to ask them where Northwind Lodge / Red Rock is. OR, you could drive right past Brandau for 12 miles straight ahead. You’ll cross a concrete bridge over Garden Lake, then pass the Fall Lake Recreation area, then in 5 more miles (or so) you’ll see Wood Lake and then in 2 miles, Tofte Lake, then in 1/2 mile, you’ll see Ojibway Lake Landing and our sign right behind it on your left. And, there you have the old school way of finding Northwind Lodge. If you can’t find us with the above two direction sets, I give up. Stay out of the woods.